This is the Door to the Den. Clark AB, Republic of the Philippines. Did you ever work an intercept position (linguist, Morse intercept, non-Morse intercept)? Recognize a single/multi-channel teleprinter signal? Do the terms "dittybop", FLR-9, TEBO, FLEXSCOP, or R-390A/URR sound familiar? The 6922nd Security Group, U.S. Air Force Security Service, was located in the northwest part of Clark AB, Republic of the Philippines. We were a small, elite (we thought so) group of essentially non-conformists, content to work in our little enclave as intercept operators, linguists, and analysts. Life was truly an adventure, we traveled near and far to places like San Fernando La Union, the South China Sea, and Manila. Locally, we ventured out to such exotic places as D'Office, The Horseshoe, Blue Eagle, Pig Alley, The Strip, and of course, our favorite hideaway, the Little Brown Jug. The base has been closed since 1992. Remnants of the AN/FLR-9 antenna are still there, incorporated into a large "Expo". But alas, Building 850 could not withstand the weight of the ash and rain after Mt. Pinatubo blew up. there is no evidence that our workplace ever existed. For many of us, our stay there was one of those experiences that changed our lives forever. We still gather periodically to tell stories, lies, and reflect on what we were, how far we've come, and how much we miss those "good ole days". So sit back, relax, and take a few minutes to see what life was really about back then. By the way, if you are looking for any newsworthy revelations of what we did or who we were listening to, you won't find it here. I made sure that the stuff on these pages is safe for open discussion. 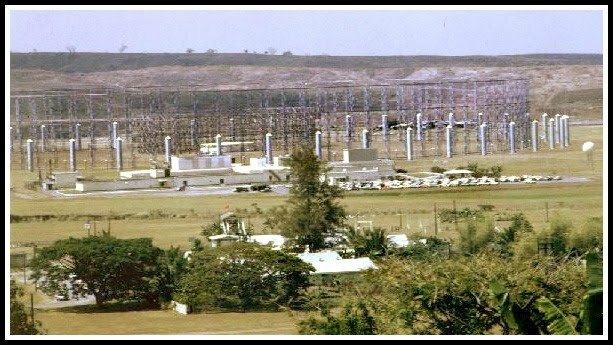 AN/FLR-9 Antenna (yes, it was huge, 32 acres) with the Operations building (850). The Cobra Den was a lounge/ hangout on the 1st floor of the barracks of the the 6922nd Security Wing, U.S. Air Force Security Service, USAFSS, located at Clark AFB, Republic of the Philippines, circa 1960's-1970's. It was the place where we gathered just before boarding the blue bus to head out to our workplace, building 850.